Our house has shiny brass everywhere, and I mean everywhere! I am not a fan, neither is Jared. We have replaced the kitchen light fixtures but everywhere else is untouched. 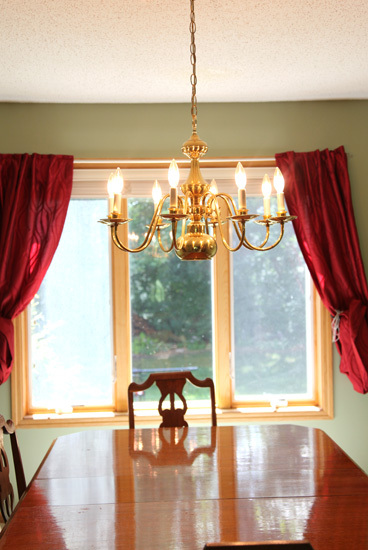 Light fixtures aren’t our biggest priority so any way to update without spending very much is a great short term solution. 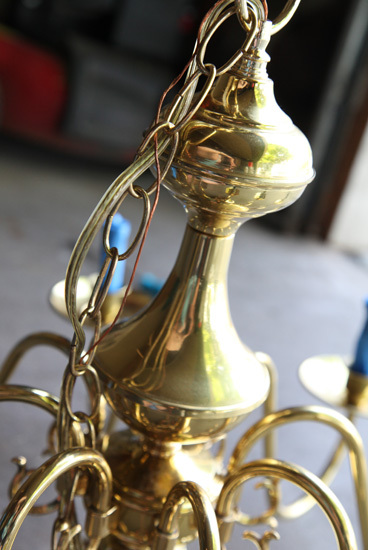 Shiny brass and candlestick light bulbs. The functionality of the light I actually really like, it has 8 bulbs above but also the very bottom has a light too. We can have both on or one or the other which is nice. 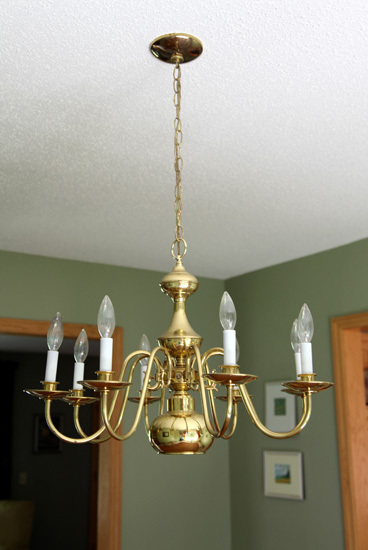 So I don’t hate the fixture I just hate the brass. 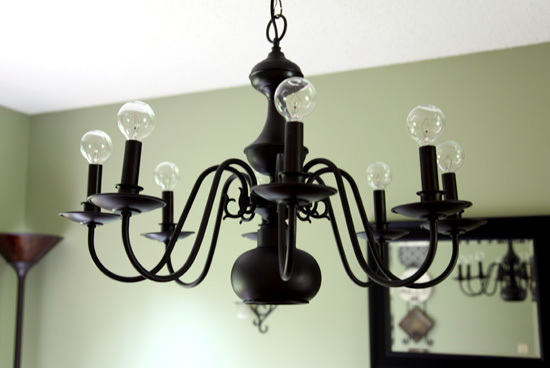 I’m not afraid of a little spray paint but the thought of turning this fixture white or plain black never really sounded that appealing. 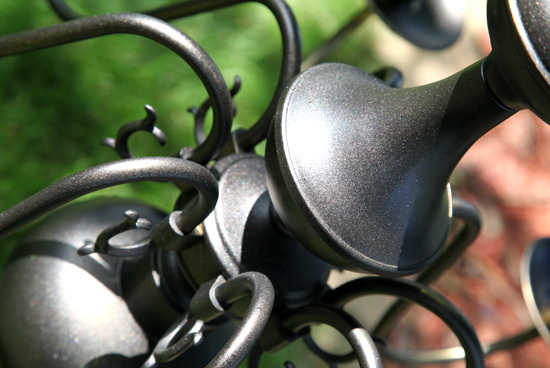 Recently I’ve heard a lot about Rustoleum’s Metallic Oil Rubbed Bronze spray paint. 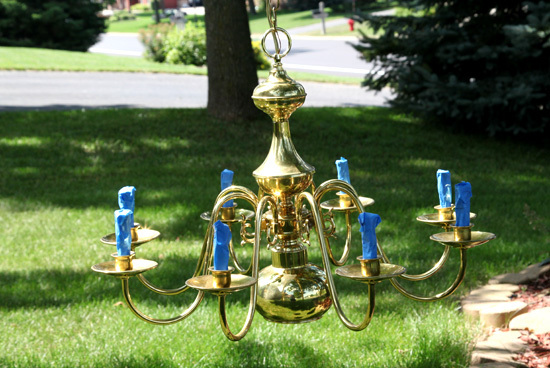 I thought the sheen and color would work well on this fixture. So off to the store we went. After trying Menards and Mills Fleet Farm we found the spray paint at Home Depot. I shut off the power and started taking down the light. I marked off the wires so I would know how to re-attach later. The fixture wasn’t too heavy so once I had it down I needed to figure out how to hang it up outside to paint. After wandering around our yard and in our garage I made this up. 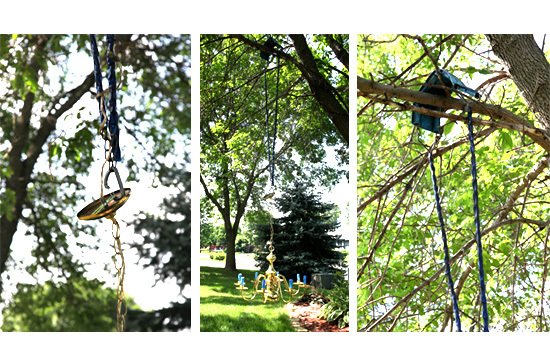 I used an old swing, a carabiner and our front yard tree. 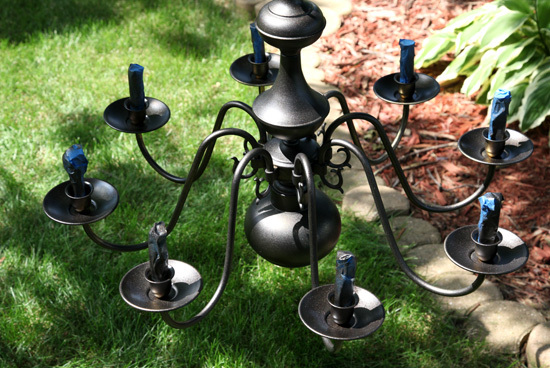 I did get a lot of looks as cars drove by but I figure I was just classing up the front yard with a chandelier! I removed the white sleeves from the fixture and taped off the exposed sockets. I then got my spray paint action on. I followed the directions on the can and kept about 8 -10 inches away from the light and did a lot of thin even coats. LOVE the finish! I found a tree branch and put all the sleeves on to paint. We also replaced the candlestick light bulbs with more modern circle fixtures. I love the new look. It really updates the room. I spent a total of $14 on spray paint but I have a good portion of the second can left for another project. The light bulbs cost me $4. Not a bad price for an afternoon update. What have you updated with spray paint? 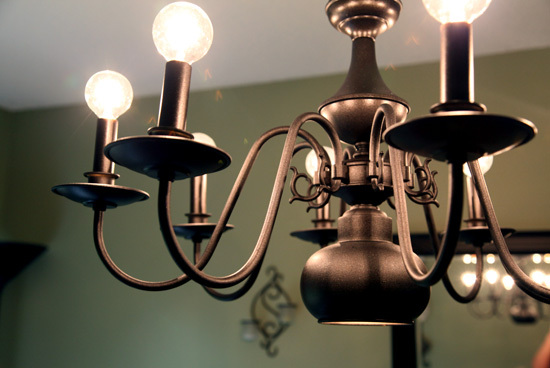 Have you swapped out light bulbs for a fresh look? 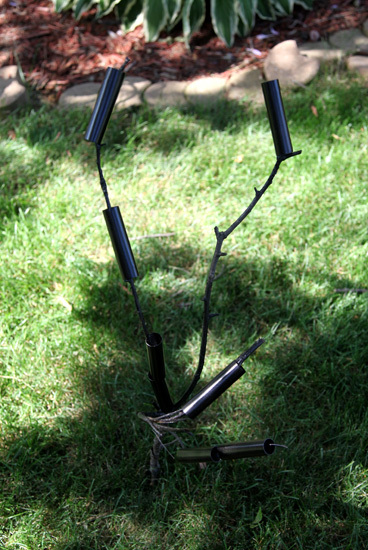 creative use of the swing on the tree, haha love it! What a wonderful update! 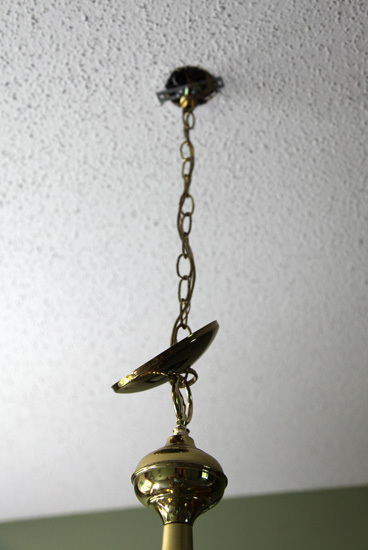 I’ve been planning on spray painting our brass door knobs, and now I think I’ll do our brass ceiling fan too! Great job! 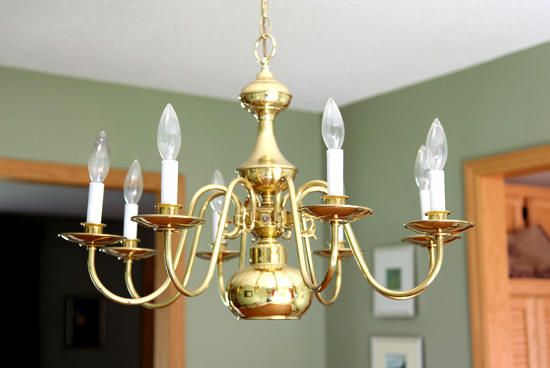 I am wanting to paint a brass chandlier for my daughter’s bedroom. Did you paint the cord and the links that lead up to the ceiling?? I painted the whole thing. I just hung it up from the tree and went to town with the paint! I really am loving the results, even better than I hoped it would turn out! That looks wonderful!! 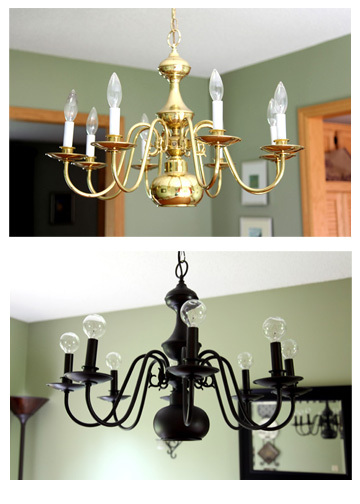 I went back and forh between black and oil-rubbed bronze for ours, but ended up going with black! I am seriously loving your new bulbs though… I’d love to change ours! Where did you find those? 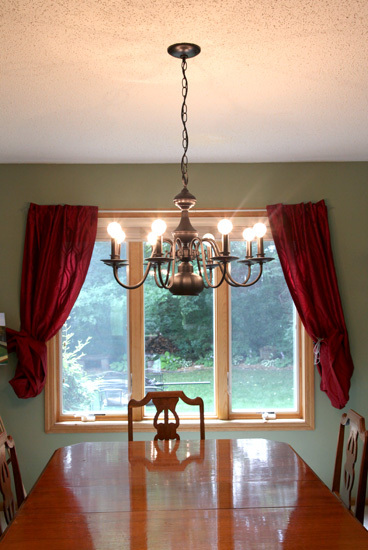 Also, I’m a little jealous of the light on the bottom of your chandelier- that’s awesome!